By Eva | October 19, 2010. 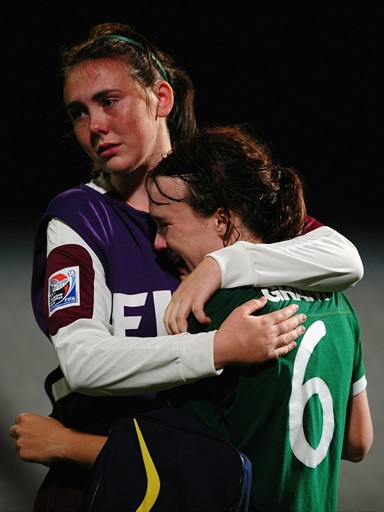 The Republic of Ireland women’s under- 17 team had reason to make Trap’s army jealous by making it to the quarter final of the FIFA Women’s U17 World Cup in Trinidad and Tobago. However, their dreams of cup glory were cut short by eventual runners-up Japan, in a closely contested match that saw Japan win 2-1 in Trinidad. A 67th minute goal was enough to see Japan through to the semi-finals after Ireland levelled the score in the second half. Japan had gone a goal up due to a dubious first half penalty which was strongly protested by the Irish, when Megan Campbell looked to have made a good tackle on a Japanese striker. The girls in green hit back in the second half when Denise O’Sullivan took advantage of confusion in the Japanese box and duly buried the equaliser. Unfortunately it wasn’t enough to contain the Japanese and with just over 20 minutes to go, Kumi Yokoyama clinched it with a wonderful strike from outside the box. An impressive campaign saw the Irish top their group on goal difference, despite losing 2-1 to Brazil in their opening fixture. Manager Noel King didn’t let the early defeat get to his side and they recovered by beating both Canada and Ghana in their remaining two group games. Siobhan Killeen opened her World Cup goal scoring count against the Brazilians in the first game and doubled her tally in the second game against Canada. The Raheny United striker received the ball on the edge of the area and curled a stunning strike into the top corner in the 76th minute, giving the Canadian keeper no chance, and collecting all three points for her team. This result left Ireland’s group delicately poised for the final group fixture, with all four teams on three points. Despite losing their opening game to Canada, Ghana had hit back strongly with a 1-0 win over much fancied Brazil and posed a very tough test for the young Irish team. Two first half goals from Megan Campbell and Stacie Donnelly and a missed penalty from Ghana got Ireland off to a great start. On their way to sealing qualification, Aileen Gilroy clinched top spot in the group on goal difference with a brilliant long range strike. The last-eight defeat to Japan saw the end of a marvellous summer for the under-17’s, who qualified for the World Cup after reaching the final of the UEFA Championships in June, only missing out on becoming European champions by losing on penalties to Spain.